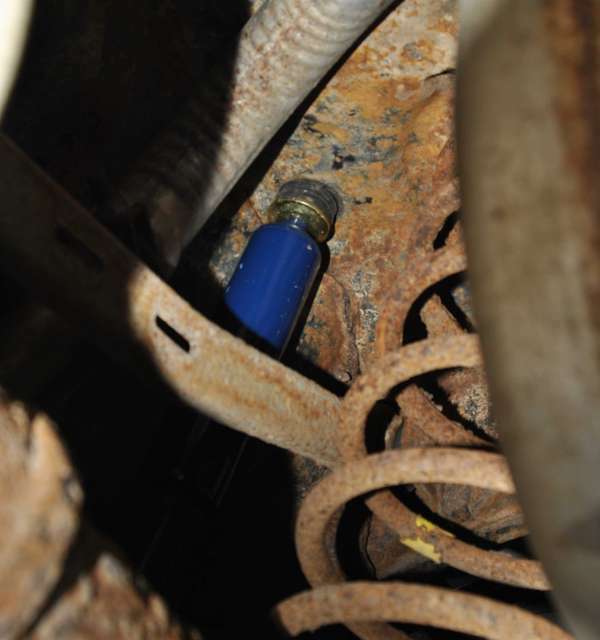 Recently I suffered a total failure of the right rear shock absorber on my car, a 2000 Mercury Grand Marquis1. Symptoms of shock failure include the car bouncing up and down repeatedly after hitting a bump, and vibration at highway speed, similar to what you would get with an imbalanced wheel or bad front end alignment. So, I need to replace the shocks on the rear axle. If you're reading this, you've probably realized that that's way easier said than done. Like most cars these days, it seems like they've gone way out of their way to make this process as tedious and unpleasant as possible. 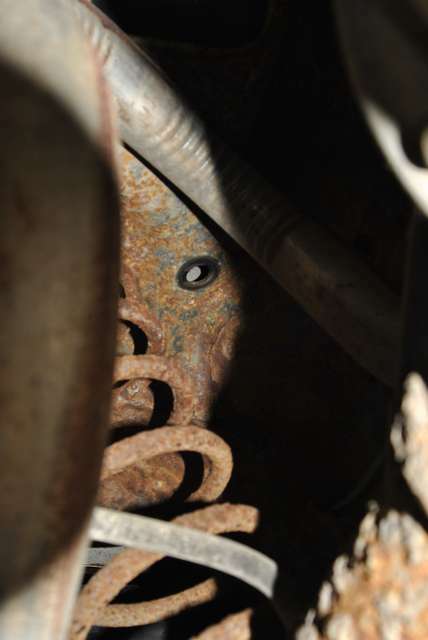 Shocks on older cars were almost universally held on with a bolt going through a rubber bushing on both ends, on this car only the bottom is held this way. The top, for whatever reason, is fastened by a stud protruding from the top of the shock, which goes through a pair of rubber grommets and a hole in the frame. The most difficult part of this process is dealing with this stud, since it's about six inches back in and under a 1" gap between the frame and the floor of the trunk. First step is to get everything off the ground and on jack stands. (Safety note: never work under a car while it's on a lifting jack, it's not like jack stands cost a fortune) The wheels should be slightly off the ground. I started by taking the bolts off the bottom of the shocks first. Getting this end loose was a cinch. 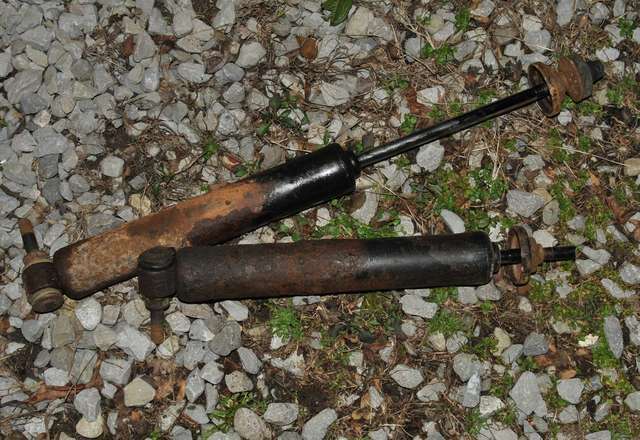 It was pretty rusted, but came off easily enough with some WD-40 and an impact wrench. I had to cut the rubber grommet away and hold the bolt with an 18mm open end wrench to keep it from turning. The nut is also 18mm. Tackling the top was more challenging. The only thing that will fit in such a small space is a GearWrench, and even that just barely. I found that I could turn the nut with a 9/16" GearWrench, but how to keep the shaft from turning? I thought about clamping a strap wrench to the top tube of the shock, but it's made of thin plastic and not solidly enough attached to keep anything from turning. I ended up cutting that plastic tube off with a utility knife. My next idea was to clamp a pair of Vise Grip pliers to the bare piston, which was a very uncomfortable and awkward procedure2. That worked, but I couldn't really get enough leverage, since the end of the wrench just barely stuck out and I could only turn it with a couple of fingers. I also tried using an open end wrench on the nut and turning the piston from below, but that didn't work because there wasn't enough clearance to fit something like a pipe wrench in there with the gas tank and exhaust pipes in the way. Plan C involved using a reciprocating saw with a long 10 TPI metal cutting blade. The shocks are already bad, so cutting them off is no big deal. It is really unpleasant though, since the rubber bushing melts and smokes right in your face and 20 year old rubber burning smells like fermented cat pee. It takes a while to cut through the hardened steel, and you'll probably need more than one blade. 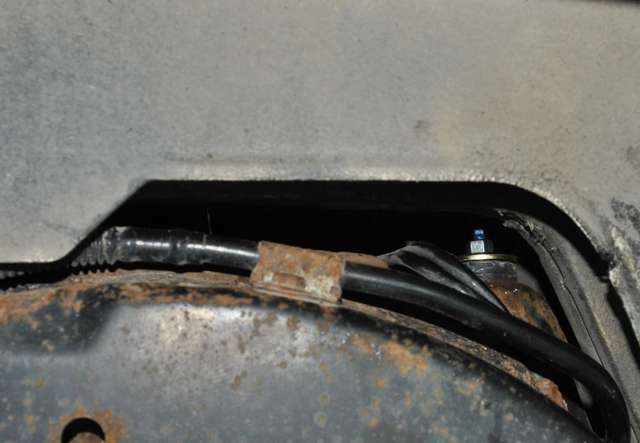 You also need to be careful not to puncture the lines running along the frame rail, two plastic fuel tank vent lines on the passenger side and a brake line on the drivers side. If you're not super careful, the back of the hot blade can melt through the plastic lines, which will result in moisture in your fuel tank and a check engine light for inadequate fuel tank vacuum pressure. Once the stud is cut, the shock should just fall right out. The new ones are a lot easier to put on than removing the old ones, but still a pain. I did the top first, by putting the rubber bushing and steel washer over the hole in the frame and poking the stud through it from underneath. It's a lot easier than trying to fit them over the stud in such a cramped space. From there I just popped the nut onto the stud and tightened it down with the GearWrench. I don't know what the torque specs are, and you can't fit a torque wrench in there anyway, so I just tightened it down until the rubber donut started to look squashed. After all that, the bottom end is pretty anti-climactic. 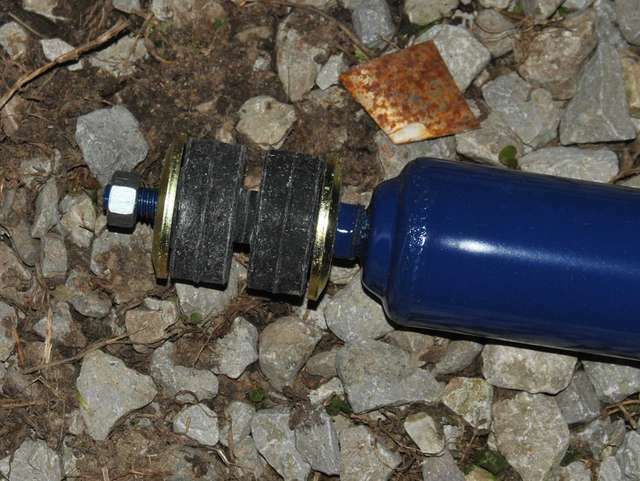 You just use your lifting jack to raise the rear axle up enough that you can fit the bolt through the bracket on the axle and add the locknut and washer. I used the impact wrench to tighten it. The ride quality was much improved, no more bouncing and no more vibrating. 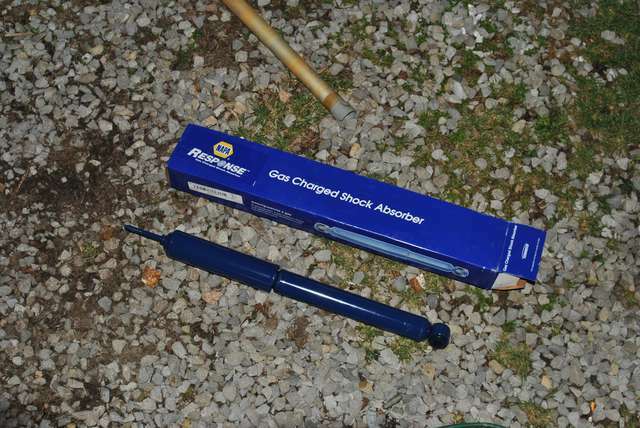 I bought the shocks at NAPA for around $15 each (part #RR 94178), and they came with all of the hardware. Only the left one was bad, but you should always replace both, since the failure of one causes the other to overheat. If you don't have a set of GearWrenches (and you should) you can get a single 9/16" GearWrench from Ace Hardware for about $12. A regular box end wrench will work, but will take forever. The long blades for the reciprocating saw were $23 for a package of 5. I should probably also mention that I used my hands to position the rubber donut/washer assembly and nut on the top stud, but if you have big hands you're gonna need something like a pair of long tongs or at the very least some skinny pliers to reach in there. This article also applies to the Ford Crown Victoria, Lincoln Town Car, and Mercury Marauder, since they're all the same car. If you have a model with air suspension you're really in for it. This probably would have been easier if I hadn't done it when it was 30° outside.